Every year, organisations lose around 5% of their annual revenue to fraud. For small businesses without serious checks and balances in place this percentage can be even higher. The impact of fraud is something that has made a lot of headlines – financial cost, reputational damage and a loss of employee or customer trust are just a few of the consequences that can arise as a result. So taking steps to prevent fraud is essential for every organisation – on-site shredding is a necessary part of any fraud prevention strategy. What’s the risk to businesses? Individual identity fraud and the risks to consumers tend to be most often mentioned when it comes to fraud prevention. However, there are also serious risks for organisations that need to be mitigated. These primarily come from employees. Disgruntled employees may find ways to take their revenge against a business by committing fraud, for example. Those who are not happy in their jobs may be motivated to steal from an employer. If there are no safeguards in place when it comes to securing recycling bins, or ensuring that documents and files containing sensitive information are properly disposed of, employees may simply leave them around. Information can end up in fraudulent hands by any number of means. Lockable bins ensure that once papers and files have been disposed of for recycling there is no opportunity for these documents to be removed from the container. This reduces the potential for opportunistic theft with the intent to commit fraud and makes it easier for businesses to control how data is handled. On-site shredding means that documents and data are disposed of before leaving the premises. One of the biggest risks for exposure of information that could lead to fraud is when documents leave the building. An on-site shredding service ensures that papers and files are completely destroyed before this happens and so cannot support potential fraud. 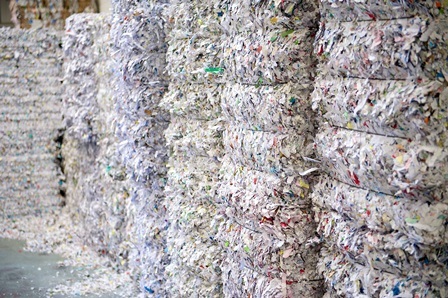 On-site shredding sends a clear message to employees. A lack of controlled disposal of documents and data can give the impression that the business doesn’t take document destruction seriously and isn’t really aware of the risks that this poses when it comes to fraud. This may lead employees to believe that they can get away with damaging the business in this way. With an on-site shredding service in place a clear message is sent to employees that the business takes these responsibilities seriously and doesn’t tolerate those who expose the business to unnecessary risk. Fraud is a big issue for UK businesses but introducing on-site shredding provides an opportunity to minimise the risks. Get in touch with Shred-on-Site today.